Hi-Standard were a Japanese punk rock group who formed in 1991. 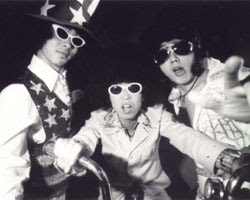 Since then, they have become a popular and influential part of Japanese non-mainstream music. The release of their hugely popular Making the Road sparked sold-out Japan shows and US/European tours with punk bands such as NOFX, WIZO, and No Use for a Name. Although Hi-Standard were Japanese born, all of their major releases were sung in English. Live footage of the band shows them talking to the crowd in their native Japanese and then immediately changing to English for the songs.